The ideal wife never nags. Nagging of a husband can be just as destructive to a marriage as unfaithfulness; and it is much more common. Nagging may be slower in bearing its evil fruit, but the final parting is none the less bitter. “The stroke of a whip makes a blue mark, but the stroke of a tongue will break the bones. Many have fallen by the edge of the sword, but not so many as have perished by their own tongue.” Ecclus. 28, 21. Nagging is the opposite of inspiration. An inspiring wife uplifts her husband. The nagging wife tears him down in whose eyes he should never be torn down–his own. Since a nagging wife is such an abomination and since God has endowed her with the ready faculty of inspiration, why do we have so many wives who fail partially or completely in this respect? Before I give what I think is the answer to this vital question, let me mention briefly a very small group of wives. I suppose that there have to be just so many sour grapes in every vineyard. Some women are congenitally cantankerous, fault finding, carping, and shriveled souls, who need no reason or explanation for their nagging. This type should be included in the long list of evils from which we ask God to deliver us. Every man child should begin at a tender age to pour out supplications that he never cross her path. He who falls into her clutches must endure a ball and chain type of existence seldom suffered even in concentration camps. One cheerful thought in this connection is that God never allows nature to go too far out of balance. He never allows birds to die out so that insects and worms take over. He also sees to it that there are always enough insects and worms to keep the birds fat and happy. This shrew type of wife, thank heavens, is not too numerous. I like to think that she generally attracts her counterpart, the male scoundrel. Most women who nag their husbands do so because they love their husbands. And the reason why wives are more prone to nag than husbands is that wives love more than husbands. This sounds very paradoxical, and it is. Yet it is true. Love has many peculiar and even unexplored phases. When a woman loves a man, she creates an ideal of him in her mind. She can find no wrong in him, For a time the fierceness of her love may blind her to reality. Sooner or later she begins to notice discrepancies between the ideal and the reality. He is not neat around the house with his personal belongings. He could be more punctual for meals. At least he could telephone and warn her of any unavoidable delay. Her paragon of all virtues, her idol, begins to show his clay feet. He has a lazy streak and does not help her as much as he could around the house. These and similar shortcomings, even defects of character, pain her because she loves him and wants him to be perfect. She hopes that mother or the neighbors have not observed these failings. Perhaps she begins her campaign by whining at him. His unfavorable reception of this startling innovation in their heretofore unperturbed connubial bliss spurs her into more direct attack. She relates his faults to him and scolds him. Like a school child he is put on the carpet and lectured. The old boy does not take to this procedure and strikes back with a few pointed criticisms of his own. Unless she is on guard, her chagrin at failing to improve the object of her love soon grows into resentment. She is in danger of becoming a chronic nagger. The history of the nagging wife is a desperate effort to kick her husband upstairs. He usually ends up at the bottom flat on his face. To escape her sharp tongue he fabricated now and then. Through his first successes at keeping peace by this mean method he was deluded into thinking he had the solution. Soon, of course, his false way of life boomeranged. He was trapped in his lies. He lost her confidence and esteem. Then he was inclined to avoid her as much as possible. His walk down to the corner drug store for a paper in the evening was an escape. One evening he ran into several old school friends at the entrance to the tavern next to the drug store. He enjoyed the half hour or so in the tavern that evening. Everyone was congenial. Everything was very pleasant, very different from the atmosphere back at the house. Later that evening husband and wife had a fight. “Are you going to become a tavern bum?” was more than he could take. He slept poorly the rest of the night and went off to work the next morning sullen. The boss and he had another talk about the promotion. He hoped that the boss did not mistake his dull and unenthusiastic demeanor as a lack of confidence. Or was he confident in himself? He was definitely on edge as he returned home again. Soon after supper he went off to the tavern feeling sorry for himself, and a tavern is no place in which a man can safely feel sorry for himself. This husband was now in a pattern well known to counselors on marriage, a nagging wife and a husband seeking escape and consolation in drink. A wife must never nag. It is one of the great sins of a married woman. Anybody could understand if she had fallen in a bad moment. Few of us are perfect. Yet one sin does not make a vice. There is no possible excuse for her becoming a chronic nagger. A wife will never succeed in kicking her husband upstairs. She may lead him upstairs, entice him, joke with him, and inspire him. By nature she has been endowed with the equipment to do this. It has been frequently said that a man must have a woman behind him. The real truth is that every man must have a woman in front of him. Everybody likes to be the object of good-natured kidding. It is a sign of popularity. It rubs our vanity the right way. I did not sufficiently realize what was going on at the time, but now when I look back on my boyhood, I realize that my mother was a clever wife. She joshed and poked fun at my father. We children got a big boot out of it. In fact, the most pleasant recollections of my youth were these sallies into the foibles of my father. Down inside, my father really enjoyed the game, even though he may not always have let on. Now I realize that there was a method in all my mother’s banter. Often she was putting over a point, a point which carried danger in it and could not be handled except in a good-natured kidding way. She was accomplishing the same objective as a nagging wife. But what a world of difference in the method and the success arrived at. Two New Aprons on Meadows of Grace Shoppe! 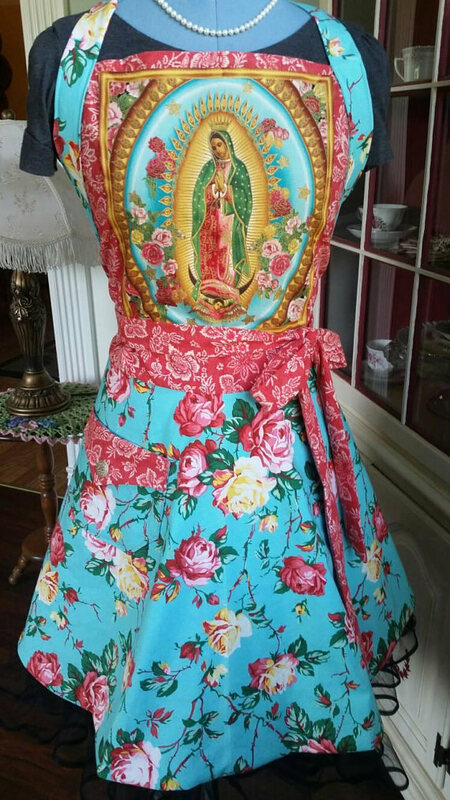 Make a statement with these lovely and graceful handcrafted apron….fully lined….made with care. Aprons tell a beautiful story…..a story of love and sacrifice….of baking bread and mopping floors, of planting seeds and household chores. Sadly, many women have tossed the aprons aside and donned their business attire. Wear your apron with joy….it is a symbol of Femininity….”Finer” Femininity! Sweet Honey Bee Apron! Feminine and Beautiful! Café a Latte Apron! Feminine and Beautiful! Good read, very very funny those posters! Thank you! My husband has nagged at me for many years and it definitely killed my feelings for him some time back. I can verify that this is true; don’t nag. On joking with your husband, it is my belief that this is very unwise, as anything you say could be construed as disrespectful and result in severe problems that will take days or weeks to repair. Same goes for joking around with older siblings. Younger siblings you might be able to joke with, but NEVER joke with a husband or an older sibling unless you don’t mind taking the risk that you might get into trouble.